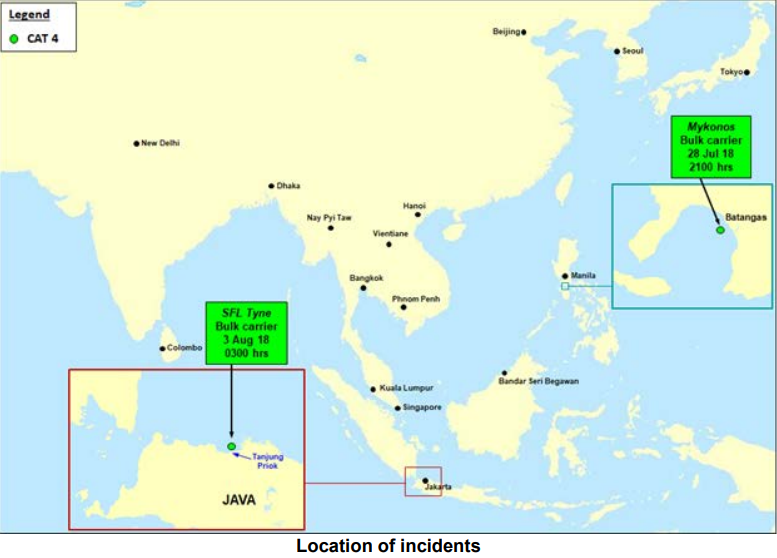 In its weekly piracy report for 31 July- 6 August, ReCAAP ISC informed of two armed robberies against ships in Asia: Both incidents involved ships at anchor, in the Philippines and in Indonesia. Included are two more armed robberies against ships occurred in Africa: at Lagos in Nigeria and in Georgetown, Guyana. The first incident was reported at Mabini Batangas Anchorage Area, Philippines, on 28 July, and involved the Marshall Islands-registered bulk carrier "Mykonos". While at anchor, an unknown number of perpetrators boarded the ship, stole two pieces of fire nozzle cover and escaped. The crew was not injured. The second incident occurred about 2.6 nm north of Tanjung Priok Port, Indonesia, on 3 August, involving the Hong Kong-flagged bulk carrier "SFL Tyne". While at anchor, an unknown number of perpetrators boarded the ship and proceeded to the engine room. They stole some engine spares and escaped. The crew was not injured. While the bulk carrier "Asia Ruby 1" was at anchor in Lagos Apapa, ENL Terminal, Berth No. 8, Nigeria, four perpetrators armed with knives boarded the forward part of the ship from a skiff. The crew suspected that the perpetrators came on board with assistance of stevedores who opened the razor wire and attached line to the ship"s railing by lowering it down to waterline to allow the perpetrators to climb onto deck. The perpetrators were not able to steal ship stores as all compartments were locked and secured. They approached the duty watchman in hold No. 1 and threatened him with knife. They took his mobile phone and VHF radio and then ran away from the port side using the rope hanging down to a boat. When the last perpetrator was on the rope, the AB shouted at the stevedores and called the crew for assistance. The Master notified the APAPA Port Facility Security Officer (PFSO) about the incident by radio and phone. The agent was also informed. While the container ship "Toronto Trader" was at berth at JFTL terminal in Georgetown, Guyana, and prior to departure, it was discovered that the paint store and the bosun store were broken. Some paint, a mooring rope and some rubber gasket material were found missing. The local authorities were informed, however, the vessel was required to sail prior to their boarding. "The ReCAAP ISC urges ship master and crew to report all incidents of piracy and armed robbery against ships to the nearest coastal State and flag State, exercise vigilance and adopt relevant preventive measures taking reference from the Regional Guide to Counter Piracy and Armed Robbery Against Ships in Asia."